Are you looking for a crowd pleaser? You’ve found one with Premio Hot Italian ABF Sausage. Our Hot Italian ABF Sausage is antibiotic-free and packed with flavor. Whether you’re making simple sandwiches or searching for a “secret” ingredient to make a challenging dish even hotter and tastier, this sausage is just what you need to please a hungry crowd. Look for a grocer that carries Premio products near you now. Ingredients: Pork, Less than 2% of the following: Water, Salt, Sugar, Spices (including red pepper & fennel), Paprika, Potassium Chloride, Natural Flavors, Extractives of Paprika. Log in to leave a review on this product. Turn up the heat, the flavor and the fun! 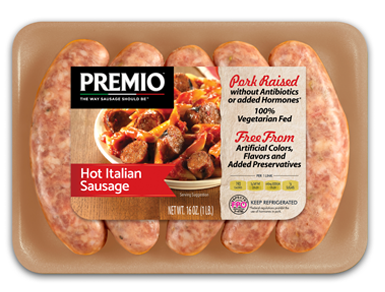 Our hot Italian ABF sausage links from Premio Foods are the perfect go-to protein for any meal. From side dishes to main courses, they help you make your meal a little more intense and a lot more delicious. Trust our company for all your sausage needs, from sweet to hot and everything in between. We’ve spent several generations perfecting our sausage recipes, allowing us to become a leader in the industry. You’ll never get any fillers when you buy from us, ensuring that you can feel good about serving Premio Foods hot Italian ABF sausage to all the people in your life. Looking for a yummy grilling ingredient this summer? Whip up a platter filled with sausages, including our hot Italian sausage links. Not only do they go great on sandwiches piled high with veggies and your favorite condiments, but they stand alone well, too. Pair hot Italian ABF sausage with grilled corn on the cob for a super summer treat everyone will appreciate. Stop fueling up in the morning with foods that only get you halfway to lunch. You deserve a wholesome, delectable breakfast, and that means adding a bit of hot Italian ABF sausage to your plate. Dice up some sausage pieces and add them to a robust, aromatic omelet made from the freshest local eggs at your farmer’s market. Or pair hot Italian ABF sausage links with pancakes. The savory and sweet tastes will combine beautifully! Tired of peanut butter and jelly? Bored with bologna? Hot Italian ABF sausage comes to the rescue. Cut up pieces of the sausage and cook them thoroughly, then add them between slices of thick bread or wrap them in a pita. Italian sausage goes well with mustard, mayo and even specialty sauces like tzatziki. When was the last time you made a homemade pizza? It isn’t hard, and it will be especially memorable when you add pieces of fully cooked ABF hot Italian sausage to the top. Slice the sausage thin, cook it in a pan or skillet and then pop it on the pizza. Top with cheese, and you’re in pizza pie heaven!